There are tons of tutorials on the internet about sending and receiving values via radio or comunicating Arduinos and Rapsberrys, most of them are too complex or they are incomplete (missing schemas or code). In this post we just want to show a simple and minimalistic way to do so with simple and cheap components using two nRF24L01 (RF24 from now on) radio modules (one in an Arduino, and the other in a Raspberry). The final code of this post and more advanced examples and schematics are available in github. That allows you to send and receive messages using some standard libraries without specifying any protocol in both the raspberry and the Arduino. Some of the connections may vary, but we will use those values in the scripts, so once they are working you can change them if you want. First you need to download the RF24 libraries for Arduino, you can find them here, just copy the whole folder into your Arduino libraries. Once the libraries are copied, you can run the following code in your Arduino. This code will send a message (lifetime). Keep it running while we work on the Raspberry PI listener. First, download the c++ library for your Raspberry PI available here , install them with make and make install. You can also compile and test the examples. 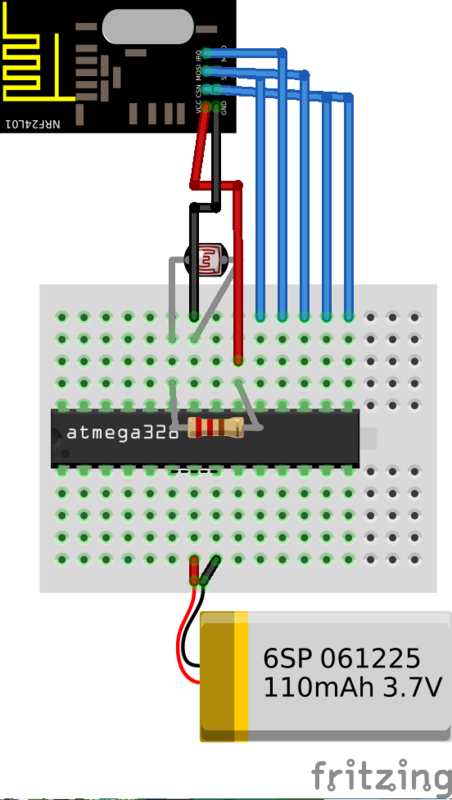 Now you have the basic library running you can add a simple sensor (light sensor) to it. Just follow the previous schematic, write the code, add an external battery and place it wherever you want. See how the messages are coming to the raspberry PI. The code mentioned is not power efficient , and its consumption may vary between 10mA and 20mA (using a minimal atmega328 configuration). However, there are a few ways to drop that consumption up to 0.5mA. First you need to use the JeeLib library to sleep the arduino (rather than using delay). That will drop the consumption up to 8mA while idle. However, this is not enough and the reason why the consumption is not ~0 is because the RF24 chip is consuming even if it is in the powerdown mode. To solve this, I hackily added a NPN Transistor to turn off the device completely while it is sleeping. This reduces its consumption up to 0.8mA, which means it can run during 5 days using a 240mAh battery. More improvements can be performed to drop its consumption. Obviously, this offer endless possibilities, we could write those messages in a queue system, or a database (redis, mysql, sqlite, etc) and run another python app in the raspberry with whatever behaviour we want. Or we could attach a tiny solar panel to the portable sensor and place it outside, so the battery will last “forever”. Do you have any other idea ? Contact us and tell us, we may do it in our next project.